A painting in the Windsor & Royal Borough Museum collection, at the time known only as 'Lady in a Blue Dress', was opened up for discussion. Could Art Detectives identify the sitter? 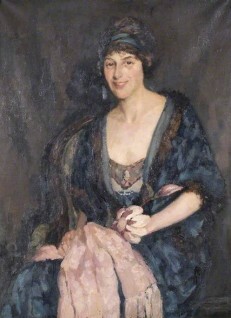 Andrew Greg gave two initial suggestions – that the sitter was one of the daughters of the Nutt family and the painting was likely to have been made in the 1920s. Andrew's proposals were the starting point for a discussion that drew a connection between the Nutt family and the Dutch artist of the painting, Sara Johanna Strumphler. Oliver Perry discovered that Lillian Nutt was, in fact, married to Arthur Ladton Lingeman, who was a relation of the artist. This was confirmed by Windsor & Royal Borough Museum, who revealed that Strumphler and Lingeman were cousins. It was later discovered by Dirk Roeland, with the use of Amsterdam Municipal records, that Lillian Nutt and her husband lived in Amsterdam from August 25th 1919 until November 10th 1922. A group photograph provided by Carol Watt, showing the daughters of the Nutt family, gave Osmund Bullock and Malcolm Fowles the opportunity to compare the daughters' faces with the portrait and confirm the sitter was the Lillian. As the first of the daughters married, she was the only woman wearing a wedding band in the photograph. Andrew Greg and Malcolm Fowles were both of the opinion that the painting dated from around 1922. Lou Taylor, Art Detective's Dress and Textiles Group Leader, agreed this was likely, pointing to the loose chignon and low neckline of the sitter's clothing as a style that was worn at this time. Osmund Bullock also spotted that Lillian was wearing a pioret opera coat as formal evening attire. By this time, Osmund had uncovered a cutting from a Glasgow newspaper, dated 25th April 1923, that discussed an exhibition at Glasgow's McLellan Galleries. The column mentioned a portrait of a girl in a blue dress by Strumphler, probably the painting under discussion, which further supported 1922 as the year it was made. Additionally, Fowles brought to attention the magnolia flower held by the sitter in the painting. Magnolias tend to bloom in March, suggesting that the painting might have been made in spring of 1922, in advance of the 1923 exhibition. Lillian Nutt was believed to be aged around 40 in the painting. Osmund confirmed that she was born in Windsor in January 1879, so this would have made her around 43 in 1922. As Art Detectives provided extensive evidence and biographical information on the sitter, it was accepted that the portrait depicts Lillian Emily Nutt, latterly Mrs Lingeman, and dated from 1922–1923. Who is this lady in a blue dress? When was this portrait painted?